The ranch is located in south central Apache County, in the eastern portion of Arizona. The ranch is approximately 180 miles east of Phoenix and 180 miles northeast of Tucson between Show Low and Springerville, Arizona. US Highway 60 serves a portion of the northern boundary of the ranch. 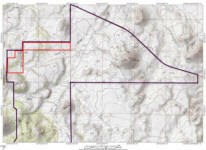 The deeded land is located at the base of the White Mountains approximately 1½ miles south of the paved highway. The lease lands of the ranch extend from open grasslands along Highway 60 over Greens Peak to high mountain meadows. The ranch is accessible by 28 miles east from Show Low and 15 miles west from Springerville, Arizona. 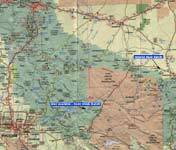 The deeded land is located 1 mile south of US 60 and ½ mile west of Forest Road 117. US 60 runs from east to west along the northern boundary of the ranch. Forest Road 117 runs from north to south through the central portion of the ranch. Access to the interior of the ranch is provided by numerous public and private dirt roads. The ranch has historically operated as a summer ranch and would be a nice yearling operation or run in conjunction with a desert winter ranch. There are no building improvements located on the ranch. Range improvements include a set of shipping corrals near US 60 (please see photo  above), two small catch pens and interior cross-fencing into 8 pastures and 1 trap. Varies from Plains & Desert Grassland to Montane-Conifer Forest. Trees include Pinion/Juniper in the low elevations and Ponderosa Pine, Fir and Aspen in the higher elevations. The deeded lands are mostly covered in Pinion/Juniper Woodland with some open grassland on the eastern side. Livestock water is supplied by numerous springs and dirt tanks scattered throughout the ranch (please see photos  and  above for example). The majority of the water on the winter range is supplied from three pipelines fed by springs in the higher elevations. The pipelines have three large storage tanks on the ranch with eleven drinkers. The pipelines are also shared with a neighboring rancher. There are no public utilities available on the ranch. There are telephone and electric lines in the area along the main highway.